Information. It’s both our greatest weapon and our most guarded asset. It’s been used to bring down individuals, corporations, armies and even nations far more efficiently than any gun or bomb. With his instant access to any computer network and ability to overrun any security system, young Victor Stone—Cyborg—would seem to be the perfect super hero for our time. Yet, as we learned in a recent interview with writer David Walker, DC’s new Cyborg series will spend just as much time getting to know the man inside the cybernetic mainframe as it will exploring the high-tech world he inhabits. Cyborg’s a character that’s been a regular part of the DC Universe for a while, but he’s recently had a surge in popularity. More and more people know who he is. What’s behind that? Why do you think that is? Well, I think it’s a combination of factors. One, obviously, is a show like Teen Titans Go!. But on the surface, he also looks pretty cool. You look at him and he’s got the metal body. I also think that there are a lot of questions as to who Vic Stone is. There’s a very universal appeal to him because when you really examine that character, you see a young man whom life has dealt a really hard hand. There’s no getting away from who and what he is. I think that we all sort of live that in one extent or another. We’re all sort of grappling with who we are. There’s who we are, and what the universe has for us. Not just the universe, but our parents, our teachers and our bosses, and so to a certain extent, Cyborg is the embodiment of that trap that we find ourselves caught up in. I just want to be Vic Stone, but all my limbs were blown off and my dad turned me into this machine and now I’m stuck saving the world three times a week. A lot of it is just going to be about Vic—getting to know Vic and his world and defining him as a hero on his own. When we really think about it, Cyborg has been around for about 35 years, but he’s always been a team player, or at best, part of a duo. We think a lot of him and Beast Boy from back in the 80’s, now it’s him and Shazam. So a lot of it is about defining him. 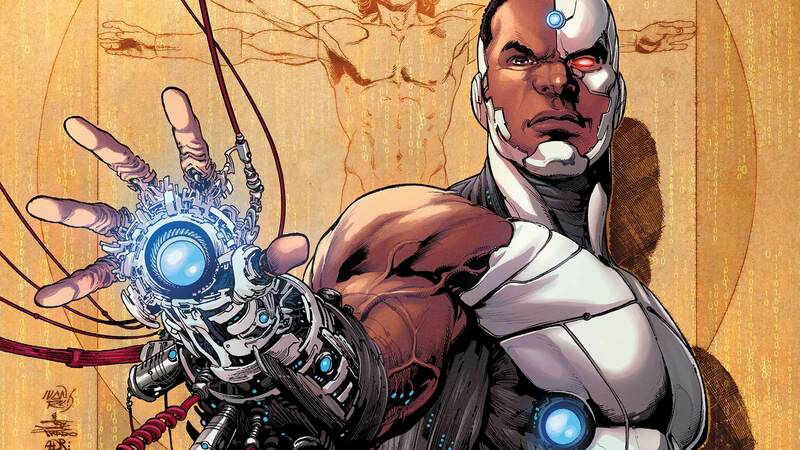 Defining Cyborg as a hero, on his own, but then defining Vic Stone as a human being in that world around him as he develops into this sort of divisive character within the world of people that are increasingly embracing technology. There’s going to be people who want to be just like Cyborg, and then there’s going to be people who don’t want Cyborg to be Cyborg, they want him to be Vic Stone, just a regular kid. I actually had a question about that. Recently, it occurred to me that with his ability to access any computer network, he definitely is a hero for the modern age, but he’s also one step removed from being one of the most sinister villains out there. I think in real life, if this character really existed, I wouldn’t trust Cyborg. Do you tap into this notion at all in this series? What would you call the tone of the series? You have all these elements that you’re talking about, but he’s a younger character who pals around with Billy Batson and Beast Boy. So what’s the tone of this series, where does it fall? I don’t want to say it’s going to be all out humorous, but it’s going to be a little more down-to-earth. There are going to be these huge bombastic moments, but there are going to be quiet moments too. I’m trying to convince everybody to let me address how this guy goes to the bathroom. He eats, therefore, he must go to the bathroom, but HOW does he go to the bathroom? I’ve started to outline a scene where he talks about it, and I think it could be pretty interesting. I used to do volunteer work with kids with disabilities, and you don’t necessarily think about that. You don’t think about a kid who’s a quadriplegic who can’t feed himself. Well, if he can’t feed himself, when it goes in, that’s trouble. When it comes out, that’s trouble too. That’s some of the stuff I would like to play with, but I would also like to really get into the relationship with his dad. We’re going to get into that. I’m also really fascinated with his relationship with the Metal Men, which really came into its own in the New 52. To those characters, Victor is the ultimate human. Whereas, to a lot of humans, Vic is like Frankenstein’s monster. He straddles both worlds, and it’s a line that we all tend to straddle these days. The moment we get a smart phone, the moment we log onto the Internet, the moment we start social networking, we are disconnecting in various ways from our own humanity. So here’s a guy, why would he want a Facebook account? Why would he want an Instagram account? He could access any one of them at any time. He’s one guy who could live tweet super hero battles. That’s an idea, I hadn’t thought about that! Since he’s more of a team player, Cyborg doesn’t have a rogues gallery. Will he be facing known villains or are you going to be creating some adversaries for him? We keep going back and forth. I had given a list to editorial of some interesting characters that we could turn into villains. The other night, some came up that I haven’t submitted yet that weren’t part of the New 52, so they haven’t been around in several years. What I’d like to see is a rogues gallery that is sort of recurring and that plays into this larger aspect of it. I’m bringing in not just a rogues gallery, but in terms of supporting characters, he’s got a whole group of people. There are some people you’ve seen before—obviously his father, Dr. Morrow, Sarah Charles, some of the classics—but then we need some all new people. We need people that represent the human side of him a bit more and that are really trying to draw that out of him. So we’ll see that. Cyborg was announced along with this huge wave of upcoming DC titles. I’m curious if there’s one or two that you’re personally looking forward to. There’s so many. I’m really excited about Gene Yang’s Superman. I’ll be 100% honest, I’m not a Superman guy, but he’s such an amazing writer. Ming Doyle is co-writing one book and drawing another. That really excites me. I’ve been loving what the Batgirl team has been doing. Prez! I did not know that there was going to be a Prez comic until I saw that. That Bizarro one looks amazing. Some of the quirkier stuff I think really surprised people, and it surprised me as well. I was actually jealous when I found out there was going to be a Prez comic. I was like, you didn’t ask me? You know, I wouldn’t do it unless I could find a really entertaining, funny and poignant way because again, there is that moment where I faced it when I was working with kids with neuromuscular disorders, where there are things that you take for granted, that you think, oh my god, I never thought I would be doing this. I would have to figure out the physics as to how it would work. If I can then make that interesting and entertaining, it’s worth a page. Maybe not a whole issue, but at least a page. CYBORG #1 by David Walker, Ivan Reis and Joe Prado, is available tomorrow in print and as a digital download.